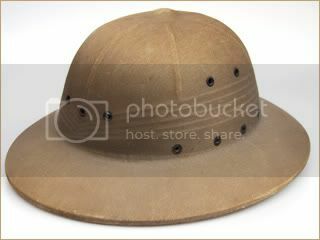 Introduced in 1940 these pressed fiber helmets remained in service for more than sixty years in tropical regions. 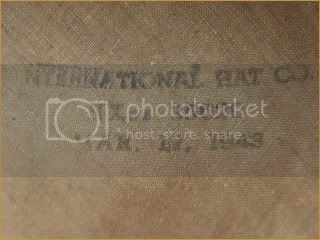 These helmets were made by the Hawley Products Company and the International Hat Company. 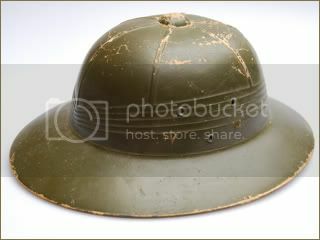 This is an early pattern version, made by Hawley, it features a leather chinstrap, and lacks any grommet at the front of the helmet, suggesting this is the earliest pattern. 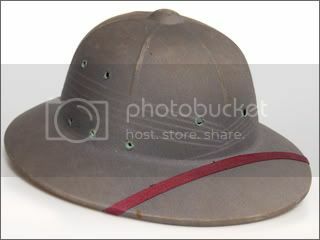 The original owner used this helmet during a shooting competition in 1939 - predating the official adoption of this helmet, further suggesting that this was a civilian-made pattern acquired by the military during the field test stage. 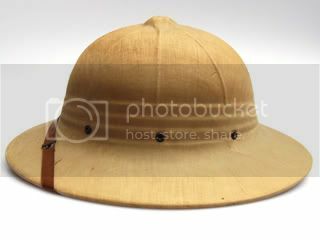 An early Hawley variation of the pressed fiber sun helmet. This pattern with three vent holes - two to hold the liner and one to hold the chinstrap - were widely used in South American and in Canada. This suggests that this pattern was meant for export. There is no front hole grommet. 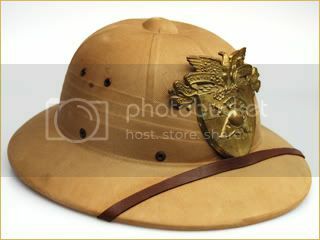 An American Hawley sun helmet with a pre-WWII officer's cap eagle, suggesting this was an early U.S. Army issue sun helmet. 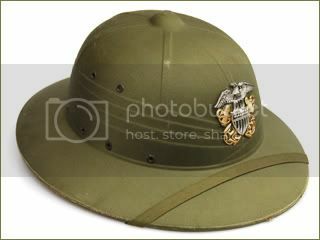 This is a Hawley made version, and this helmet features the bronze EGA of the USMC. 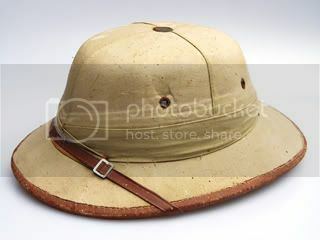 This is a version of the pressed fiber sun helmet made by the International Hat Company. It has the same basic shape, but a close inspection shows a greater number of "folds" in the faux puggaree than the Hawley version. 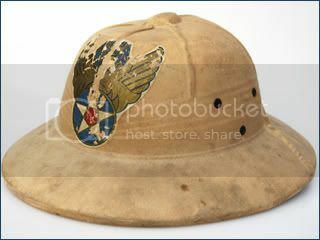 This World War II era sun helmet features a painted U.S. Coast Guard insignia on the front, making for an interesting period piece of "war art." 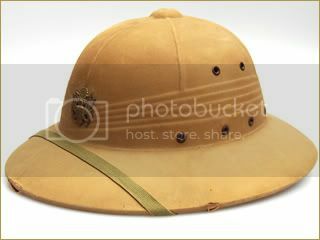 A unique pressed fiber sun helmet with a West Point cadet badge mounted to the front. 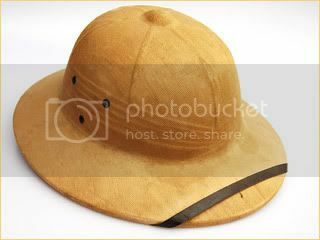 Possibly this was used by the cadet at West Point during World War II before steel helmets were readily available. This examples features the lighter canvas covering, and these helmets were used by the US Army from World War II through the Vietnam War. 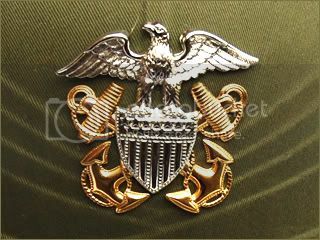 It features the standard American Officer's cap insignia. It features a Hawley makers stamp and is dated to 1948. 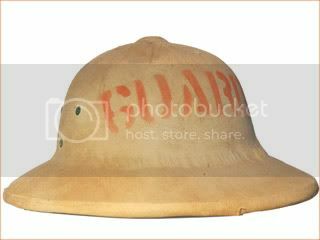 A World War II era pressed fiber sun helmet with the word "Guard" stenciled on the front. These helmets were commonly used by guards at a POW camp. 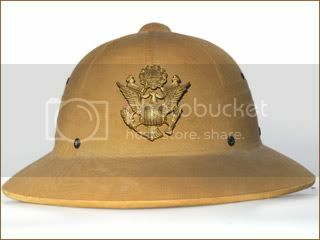 This is a post-war Hawley made version, and this helmet features the an enlistedman's cap insignia on the front. This helmet comes from the collection of good friend Chris Armold. 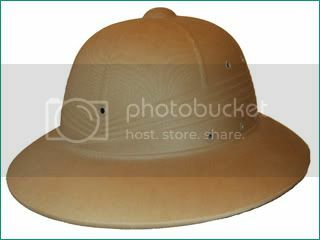 The USN used the same pattern of press fiber sun helmets as the USMC and US Army, but the naval versions were typically a darker khaki color, such as this example shown. 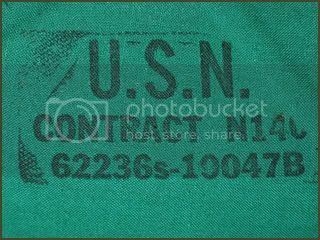 It features the USN stamp inside the helmet. 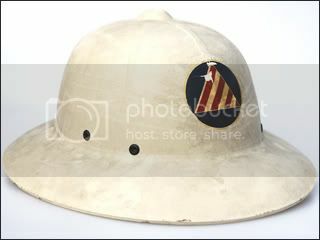 A variation of the pressed fiber helmet, this one features a World War II era Civil Defense decal. 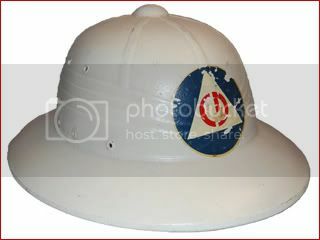 A USN pressed fiber helmet used by the Civil Defense. This helmet was painted white, and features the CD decal at the front. The normal grommet hole for a badge at the front has been covered. 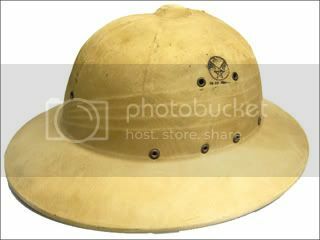 A World War II era sun helmet likely used post-war by the newly formed Airforce Association. 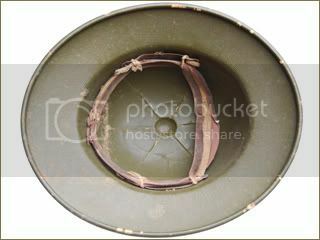 A post-Vietnam era pressed fiber helmet. 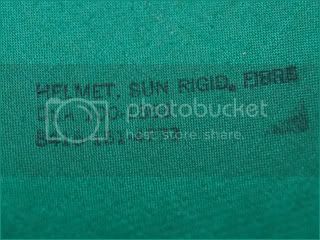 This helmet is interesting in that it has an American Army stamp that indicates that this is a "HELMET, SUN RIGID, FIBRE." 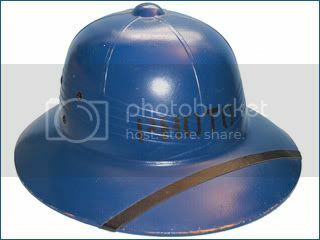 An officially blue-covered sun helmet of the type used by the American Air Force photographers in the late 1940s and early 1950s. 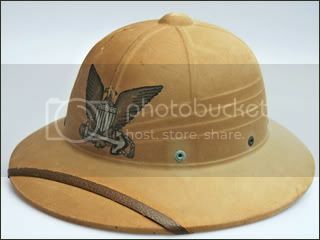 A World War II era pressed fiber sun helmet with the US Army Aircorp stamp. 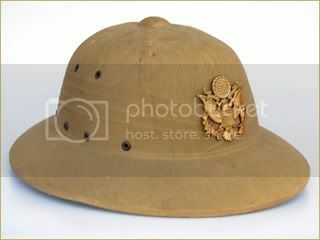 A khaki post-World War II variant of the Hawley produced helmet. 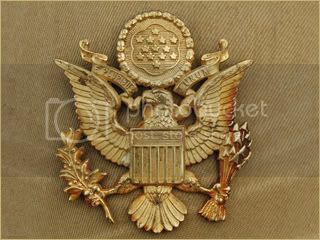 This example features three holes at the front, likely for a variety of American American badges or rank insignia. 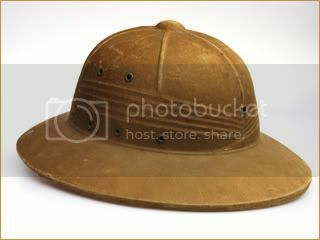 A gray clothed covered version of the pressed fiber helmet, possibly meant for post-WWII naval use. It is unique in that it also features two grommet holes at the front of the helmet. 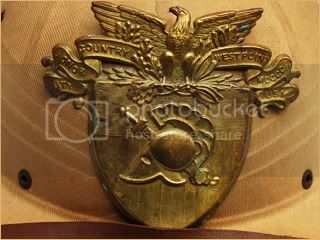 This example appears to have been produced by the Hawley company. 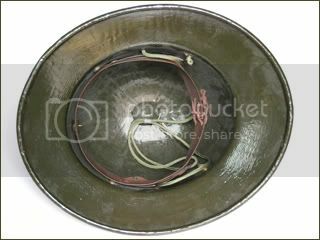 A green variation of the pressed fiber sun helmet. 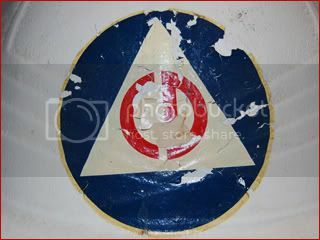 This examples seems to have been painted a flat green paint, possibly during or after World War II. 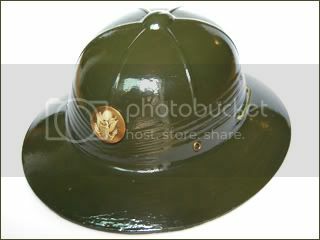 The color is similar to that of the American M1 steel helmet, indicating use by the U.S. Army rather than USMC. 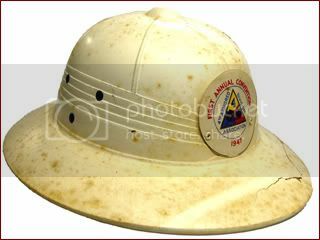 Another painted variation of the pressed fiber sun helmet. 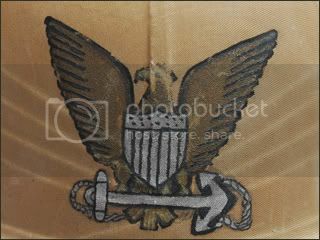 This examples seems to have been painted a green color that would appear to match the late WWII era "Ike" jacket, suggesting use by the U.S. Army, possibly in a base in the Southern part of the United States. 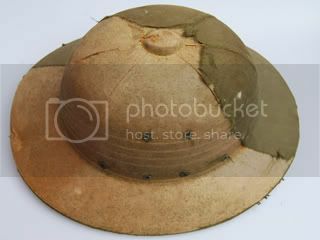 A well-worn pressed fiber helmet. 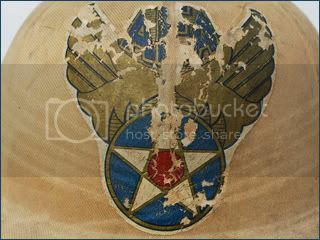 The removed section of the worn cloth cover shows the actual pressed fiber material, which is reminiscent of the early Hawley M1 liner. 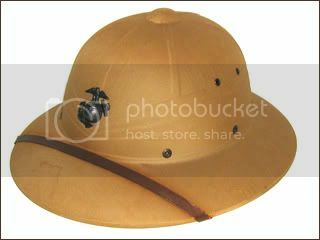 A World War II period private purchase helmet from Malacca. The helmet may have been based ont he American presseed fiber helmets as it features a faux puggaree that is is then wrapped with a real single band of cloth. 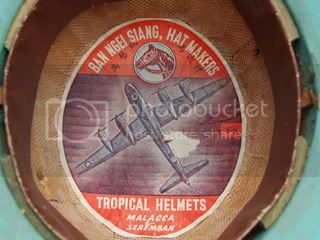 The most interesing aspect of the private purchase helmet from Malacca is the maker lable that includes a B-29 bomber!